The latest ‘IHS Markit’s Purchasing Managers’ Index’ reports that commercial building work in the UK has fallen for two consecutive months, ending ten months of expansion. 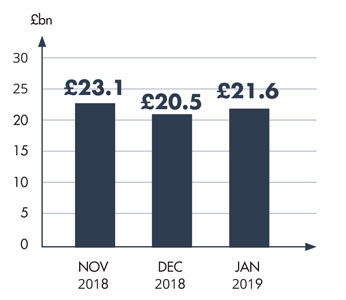 This tailing off in construction output was led by falling demand from businesses, forcing the reduction in civil engineering and commercial property work, negatively impacting the sector. The housing sector was the only category to register construction growth in February. Despite the rate of expansion being modest, due to a general drop in confidence across the housing market, this was the thirteenth consecutive month of growth for residential work. Despite the recent raft of positive news about the commercial property industrial sector, the research reveals that both market proportion and volumes declined year on year. This is attributed to the fact the creation of prime stock is dominated by a small number of firms who are holding the property for income, not with the intention of trading. In this scenario, it is challenging to foresee how volumes can advance by the same proportions as occupier demand. For the third consecutive month, the average prime yield for all sectors was maintained at 4.77%. Liberty London, the retail landmark on Great Marlborough Street, founded by Arthur Lasenby Liberty in 1875, has reportedly been put on the market. Private equity firm BlueGem purchased the store in 2010 for £32m. Four years later they refinanced, reducing its stake to 40%, allowing some investors to withdraw money, but nearly all reinvested in buying the department store for £165m. It is understood BlueGem is looking to sell its stake and has hired UBS to seek a private buyer. It is not clear at this stage whether other investors are willing to sell. The property is on the market at a time of upheaval for department stores and retail in general, who are facing intense competition from online retail and contending with high rates. According to the real estate adviser Altus Group, Liberty’s rates bill increased over 16% to more than £1m during the last financial year.